Homeland Energy Solutions, LLC supports various charitable efforts and projects in our surrounding communities. Homeland Energy Solutions, LLC is particularly interested in programs that serve our youth, promote agriculture, education opportunities, renewable fuels and/or community and economic development. Individuals or groups wishing to receive a donation from Homeland Energy Solutions, LLC should fill out a Donation Application. To obtain a copy of our Donation Application, please click here. 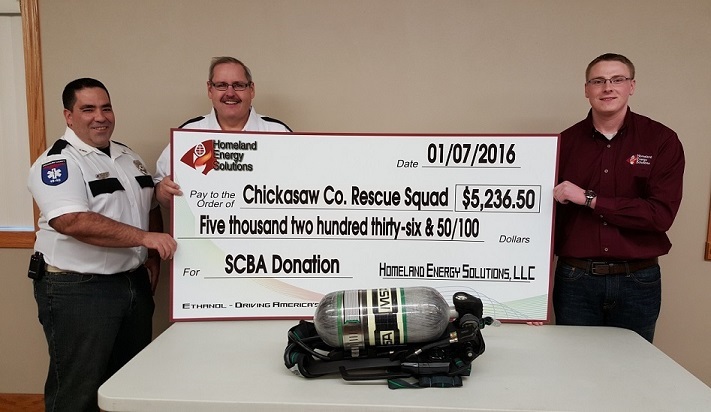 The Chickasaw County Rescue Squad has received a donation from Homeland Energy Solutions, LLC. in the amount of $5,236.50. The money will be used to purchase a new self-contained breathing apparatus (SCBA). Pictured are (from left to right):Jeff Bernatz, Rescue Crew Chief, Ken Raising, Emergency Management Director, Matthew Kuhn, Homeland Energy Solution's IT Specialist. 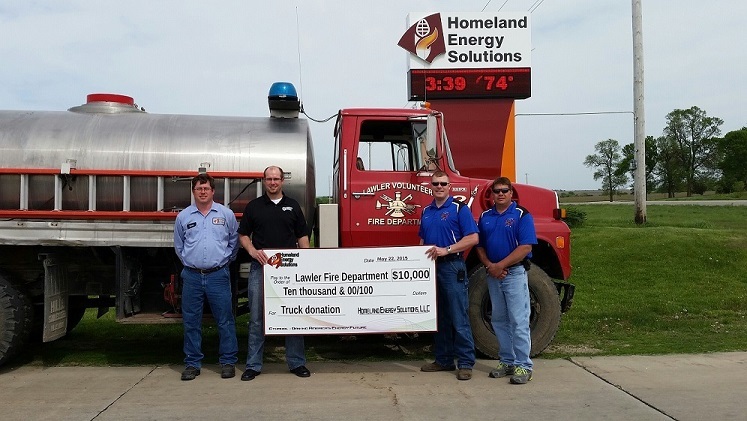 The Lawler Fire Department has received a donation from Homeland Energy Solutions, LLC. in the amount of $10,000. The money will be used to purchase a new pumper truck and replace the fire truck in the picture. Pictured are (from left to right):Kevin Howes, Homeland Energy Solution’s Plant Manager, Kyle Guertin, Homeland Energy Solution’s Safety Coordinator, Erik Fibikar, Lawler Fire Chief, and Chad Gruenberg, Lawler Assistant Fire Chief.